Every sauce-soaked noodle, crunchy peanut, fresh cilantro and lime part of it! Yes, but not scorched-earth spicy (a.k.a. Thai hot), I prefer just-gets-your-attention spicy, somewhere around medium, please. I’m not looking for a bead of sweat to form on my brow, so there’s Sriracha on the table to adjust the spice to your liking. Pad Thai with Shrimp is a quick and easy one-dish meal. If you’ve never tried making Pad Thai at home it might seem intimidating, but the ingredients are easier to find than you might imagine. Stores like Whole Foods, Natural Grocers, and even King Soopers carry items like tamarind paste, Bonito flakes, and fish sauce, though King Soopers stopped carrying bean sprouts. Dried Bonito flakes, known as katsuo-bushi or katsuobushi in Japanese cuisine, are thin flakes of dried, smoked bonito fish. Like dried shrimp or shrimp paste (often used in Pad Thai), Bonito flakes add a savory flavor to any dish. Bonito is sliced so thinly it melts into soups, sauces, or stews for a umami flavor boost. It makes a difference in this recipe, adding that extra something you can’t quite describe but is pleasant and tasty. Easy to customize with any combination of protein. Whether you choose beef, pork, chicken, shrimp, or some combination, cook the meat separately and toss-in at the end to avoid overcooking. For this recipe I recommend buying larger shrimp and cutting them in half lengthwise rather than buying a smaller variety. In my experience, larger shrimp have a better taste and texture; cutting them in half allows for more bites of shrimp throughout. Try our Pad Thai with Beef Recipe and Red Boat Fish Sauce too! 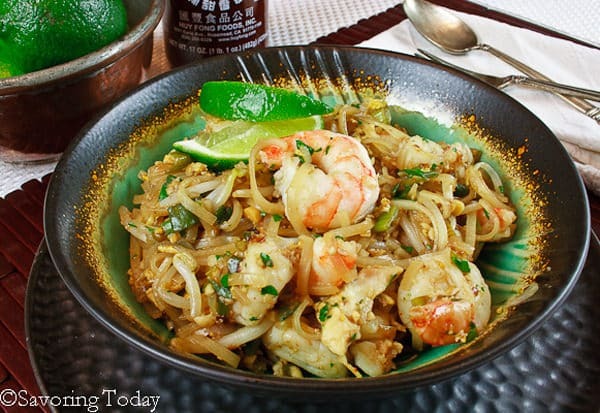 Classic Pad Thai flavors of peanuts and lime with plump, savory shrimp. In a large bowl, combine the noodles with enough warm water to cover. Soak until just tender, about 30 minutes, then drain and set aside. In a small bowl, combine the fish sauce, vinegar, lime juice, tamarind paste, crushed red pepper, and sugar; stir until the tamarind paste and sugar dissolves and is well blended. Set aside. In a wok or large skillet, heat 2 tablespoons of the oil over medium-high heat. Add the garlic, and cook, stirring, for about 30 seconds or fragrant. Add the shrimp and cook until shrimp becomes pink in color and mostly cooked through, about 2 minutes. Transfer shrimp to a plate and cover loosely to keep warm. Add the eggs to the skillet and cook, stirring to break up into small pieces, about a minute. Add the white part of the onions and cook for 2 minutes to soften (add more oil if needed). Add the sprouts, Bonito flakes, green part of the onions, fish sauce mixture, and most of the noodles; cook over medium heat until mixed well and warmed through, stirring frequently. Note: I add most of the noodles at first, then add more based on how well the sauce is covering everything in the skillet. Sometimes the noodles soak up more sauce depending on the brand and type. Add the reserved shrimp and peanuts, and cook for 30 seconds to incorporate into the noodles. Finally, toss with the cilantro and serve immediately with lime wedges and Sriracha sauce on the side. Dried Bonito flakes, known as katsuo-bushi or katsuobushi in Japanese cuisine, are thin flakes of dried, smoked bonito fish. Like dried shrimp or shrimp paste (often used in Pad Thai), bonito flakes add a savory flavor to any dish. I buy Bonito flakes at our local Whole Foods, which is easier than going to an Asian market for harder to find dried shrimp or paste. Bonito is sliced so thinly it melts into soups, sauces, or stews for a umami flavor boost. Your updated version of pad thai sounds great. I thought when we moved to Florida that the availability of ethnic ingredients would be easier to find. Actually it is the opposite and I don’t think I’ll be able to find bonita flakes. Who loves pad Thai? We do! We do! One of us orders it almost every time we go out for Thai. Thanks for sharing this recipe so we can make it at home. It looks much more doable than I thought! 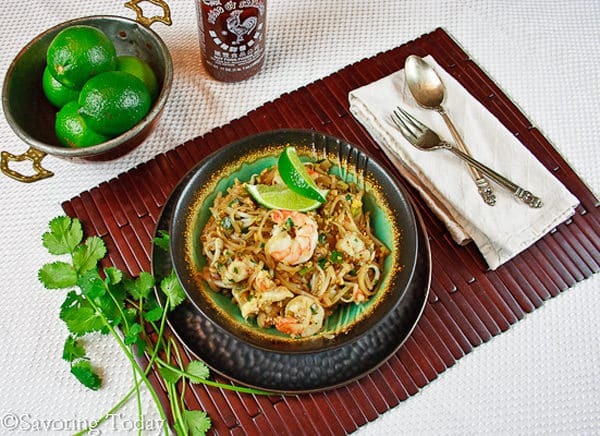 Do you mean fermented fish sauce for this pad thai recipe? One quarter cup would be way too much. What a wonderful recipe! I love love love Pad Thai. I could eat it all day every day! Oh it is very do-able, April. You are a good cook, so it would be a cinch for you and so very delish! I’ve never wanted to try pad thai because it never looks great when some people make it. But yours looks amazing! And I love the shrimp in this dish. Oh Kay, it is a must try dish! I too love Pad Thai, but have stopped ordering it at Thai restaurants because I have been disappointed all too often. Time to fire up the store and get busy making it at home!! Thanks for sharing the recipe Judy and a bit of spice is always welcome here! Jed, I think you’ll like this recipe and the best part about making it at home is you can highlight the flavors you like the most, so it’s all good. Stopping by from G’Day party. Pad Thai is my fave dish. Definitely will give it a try. Thank you for sharing. Hi Ellya, thanks so much for stopping by! It was fun to check out your blog too, so beautiful. Have a great week! My husband loves Pad Thai. I love this with shrimp. Just pinned 🙂 Thanks for a great recipe! Hi Krista, thanks for pinning and taking time to comment — really appreciate that! Pad Thai is a favorite, to be sure. In fact, only recently did I order something else while at a Thai restaurant, for the first time in quite literally years. You should have seen the faces of my dinner companions. Thanks to you, I’ll be able to make Pad Thai at home while I continue to explore other options on the menu. Yay! Thanks so much for posting this yummy recipe and sharing it at my Say G’day Party! Hi Natasha, thanks so much for stopping by and taking time to comment. Have a great week!